Annual Tau Trustees Weekend is just around the corner. Saturday, November 7. Click here for details and registration. The Centennial Pledge Class is holding its 30th Reunion in conjunction with Tau Trustees, and are inviting all '80s pledge classes to join them! Get your pledge brothers together, catch a ball game and catch up on Kappa Sigma! Be on the lookout for more information coming soon! Their record is 19-18-2. And the first edition featured #5 Texas and #2 OU during Earl Campbell's Heisman season, which UT won 13 - 6. The Longhorns would have been National Champions that season if not for losing to Notre Dame in the same stadium that next January 2nd. 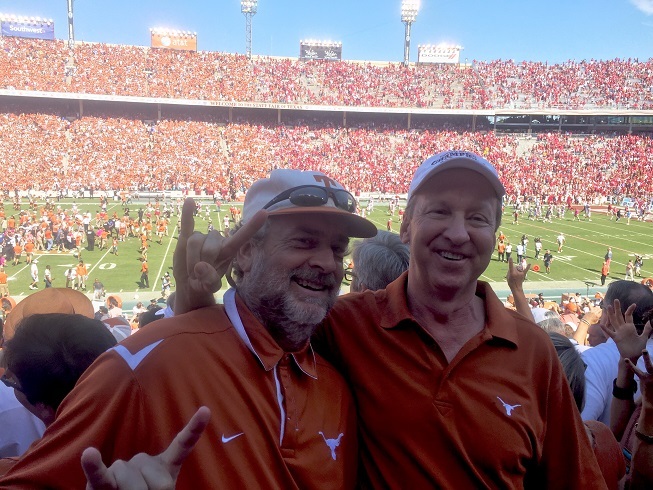 The Fall Pledge Class of 1977 has remained very tightly knit over the years, and while other pledge brothers have joined them on and off during their streak, Warren and Chernosky have faithfully kept the date. Next year will mark their 40th Anniversary, starting talk of wearing "old man" uniforms to commemorate the occasion. "But we decided to wait until our 50th for that", says Warren over breakfast before jetting off to Tanzania for another safari. Adding that, "I guess Jay thinks I'll live another 11 years." This pledge class in particular has also remained strong supporters of the chapter, both financially and in terms of service and mentoring. Warren, a Tau Trustees board member, has committed to be our largest donor thus far in the Tau Legacy 2015 Campaign, wanting to honor his late father, John R. Warren '55, who pledged alongside two other Legacy Dads, Robert Beveridge, father of Tito '81, and the late John T. Sharpe, whose son, Michael '79, pledged a year behind Warren and Chernosky (becoming Warren's fraternity little brother), and currently serves as a board member of both Texas Kappa Sigma and Tau Trustees. Warren has made Tau Chapter his favorite charity, "at least until we get them where they need to be", says Warren. Adding, "The chapter is as strong now as it ever has been. If we want to continue down this same path of continued excellence, we owe it to the actives to provide them with first-class facilities. We built them a great Lodge, and promised them more modern living quarters to accomodate more actives, and now it's time for us to deliver on our promise." Warren goes on to say, "We have all benefited in some way from our Kappa Sig experience. And this new Residence Hall will be the last Kappa Sig House built in any of our lifetimes. Now is the time to give back to Tau."